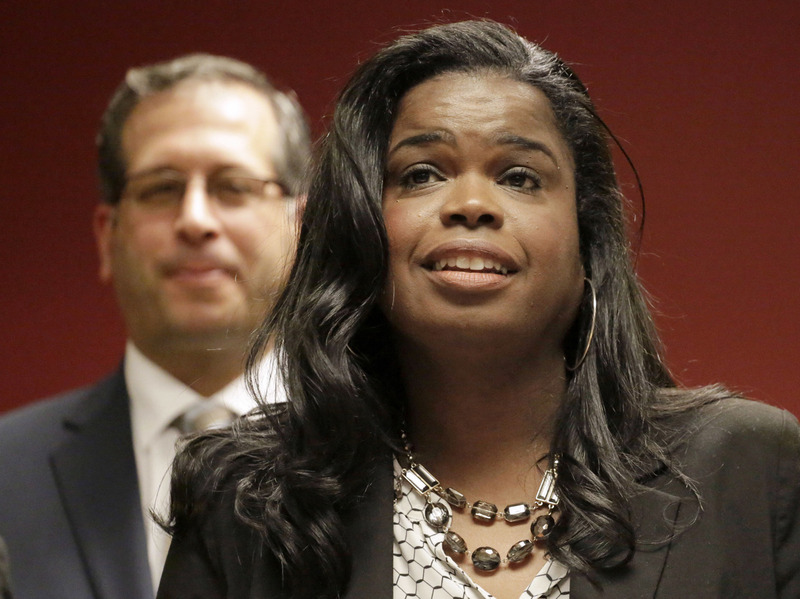 Prosecutor Kim Foxx Defends Jussie Smollett Decision In an interview with WBEZ, Cook County State's Attorney Kim Foxx explains why her office suddenly dropped charges against the actor. Chicago's top prosecutor, Cook County State's Attorney Kim Foxx, recused herself from the investigation before Empire actor Jussie Smollett was charged. Chicago's top prosecutor, Cook County State's Attorney Kim Foxx, recused herself from the investigation before Smollett was charged, citing conversations she had with a Smollett family member. Her office is now taking heat for abruptly dropping the charges against Smollett only five weeks after the allegations were filed. Speaking to NPR station WBEZ, Foxx defended her office's decision, saying that there's a "lot of confusion" among the public and that the chance that Smollett would have gotten a prison sentence if convicted was slim. Despite high emotion around the case, she said, "we have to be driven by facts." WBEZ: The superintendent of police and the mayor of the city of Chicago expressed a lot of angst about this that we haven't seen in other big cases that are arguably much more serious. What's your take on what you've been hearing from the city over the last 24 hours? Kim Foxx: You know, I think that there is a lot of confusion. For people who do this work every day, who recognize what the charges are — this is a Class 4 felony — we recognize that the likelihood that someone would get a prison sentence for a Class 4 felony is slim. I think it has opened an opportunity for us to have conversations around what does justice look like. And so, I think the confusion for people who don't understand the intricacies of the justice system, who don't understand alternative prosecution or diversion or alternate outcomes outside of prison or lengthy probation, it's a hard thing for people to process. I think it has opened an opportunity for us to have conversations around what does justice look like. Because I think what I've noticed in the last 24 hours is that concept of justice that we grapple with every day — there is no consistency even among the public of what that looks like. There's some people who were never gonna be satisfied unless Mr. Smollett spent many nights in prison, and then there were others who believed that the charging of 16 counts of disorderly conduct was excessive. And so I think this is allowing us an opportunity to be able to look at how do we do these cases overall. But, right now, there's a lot of emotion. And I wholeheartedly believe that in our work we cannot be driven by emotions. We have to be driven by facts. It does boggle the mind that, of the tens of thousands of cases that our office handles every year, that this is somehow emblematic of a relationship issue between ourselves and the police. We have said, and I will say to you, they worked very diligently on this case and that this was not a question about their abilities. But every single day on cases that law enforcement partners work diligently on, there are people who get similar arrangements, people who get diversion, people who get sentences that are probably not what some people would want. Every single day. And I don't believe it is in the interest of the people of Cook County to engage in a narrative that is anything other than all of us working collectively for the public safety of the people of Cook County. Is this case similar to other cases of this kind? Is that what you're saying? The state's attorney's office dealt with this in a similar way? Certainly. No two cases are the same. But I think we start with the initial context of this is a Class 4 felony. And so we look at what are the remedies under a Class 4 felony. Then we also look at our defendant. Is this someone that has a background? Do they have a violent background? Do they have any prior convictions? These are things that we ask in every case that we do. But when we start asking the question what is available under a Class 4 — is diversion available under a Class 4? Yes. Is this person eligible for that based on his or her background? Do they not have a violent history? Do they not have a conviction in their background? Yes, they're eligible. What's the outcome? And I think when you look at other Class 4 felonies, I think when you look at other disorderly conduct, and you ask, "Have we done this before?" — I think the data will shed some clarity on that. And do they usually happen this quickly? I think a lot of people think it just happened so quickly, and [it's] kind of also shrouded in a little mystery because the hearing happened and people didn't know about it, and now the case file is sealed. I think it depends again. No two cases are alike. So in this particular case you have someone who doesn't have a residence here regularly. And so you're dealing with when can we do what we need to do without worrying about people coming to and fro? There are people who work out these types of arrangements on the very first day. There are some people who are diverted not from us but at the police station. So there's various ways that we can do this. And so I think because it's so public, because everyone saw the last court date and sees the next court date, it feels accelerated. But we have had cases, truly, where even before someone comes in, we know what the disposition is going to be. And they can choose with their lawyer how they want to do that. And in terms of the shroud of mystery, I think the law changed a little while back that allowed for people who were going through this type of arrangement to have their records expunged and their cases sealed, and that is on the defendant — the defendant has the right to ask for that. And so, I think ... with the questions around how does this even work — this is not what it looks like on Law & Order, right? When you don't know the nuances of it, it can cause confusion. So I think that is where the angst and confusion comes from. What about people who feel like this is an example of a case that really kind of shed a lot of doubt on people who report hate crimes? And that that made this case different from all those other cases you're referring to, that there was a larger social impact to this case. How would you explain this final disposition to people who have that concern? Again, I'll start with the caveat that the final disposition was made by someone other than myself. But I understand it. I think we again have to look at these cases on the facts and the merits. This is a county that has 40,000 felony-level cases that we deal with every year. We deal with a lot of things in this city, in this county, not the least of which is a homicide rate that outpaces other major cities, shootings that outpace other major cities, sexual assault, sexual violence, domestic violence. And it is not to diminish that what Mr. Smollett was alleged to have done did have an impact on people who are actual victims of hate crime, did have an impact on how people perceived our city. But he was charged with a Class 4 felony. When I see a 2-year-old who is shot while sitting on her mother's lap and there's not that level of outrage ... I think it breaks my heart when we talk about the things that we see every day. ... The men and women of our office who, on the first date that Mr. Smollett was in court, [were] handling the case of Commander [Paul] Bauer a floor up, that there was someone else who had shot and killed six people in one family was up that same day. And yet the level of conversation about "well, what is the example that we're going to make?" — I think the example that we're trying to show is that our criminal justice system has to have mechanisms by which people are held accountable and that justice is fair and our resources are being used appropriately. And so I hear it. I hear the concerns, and I don't believe that it is the prosecutors' place to suggest that we make [an] example, because when we've done that, it has had disastrous outcomes not just for the exemplar but for those who are similarly situated. Should he have had a right to a day in court? That is his choice to make. And should we have said nothing and allowed him to go to trial and also have the possibility that he's found not guilty? Should he have had a right to a day in court? That is his choice to make. In this instance, Mr. Smollett forfeited his $10,000 bond. Mr. Smollett completed community service, and how he chooses to spin why he did those things — what I can tell you is that most people who come through the criminal justice system don't give up $10,000 of their hard-earned money or engage in volunteer services connected with an alleged offense without viewing that as a way of being held accountable.